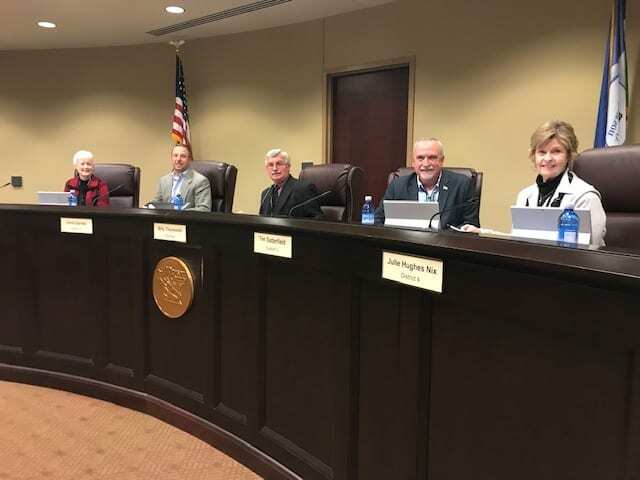 DAWSONVILLE, Ga. – Dawson County Public Works Director David McKee will ask commissioners for $44,000 to complete the intersection improvements at Hwy. 53/Lumpkin Campground Road when the Board of Commissioners meets in a work session at 4 p.m. Thursday (Feb. 14). Commissioners approved $56,000 for Vertical Earth to complete the curb work and an amount not to exceed $100,000 for the entire project. Vertical Earth has completed its portion of the project. McKee is now asking for the balance of the $100,000 approved amount to complete additional road work such as stripping, erosion control, hauling, milling, drainage pipe, etc. Last July, commissioners approved retention of Blasingame, Burch, Garrard & Ashley (BBGA) to represent the County as a plaintiff in multi-district opioid litigation. However, that firm was never formally retained and no contract for legal services was ever approved. The multi-state litigation currently involves claims from hundreds of states, counties, and cities nationwide, all consolidated in a federal court in Ohio. Discussion of Impact Fees on Commercial Businesses.